Scientists love to tell stories about the quest to understand the universe-stories that often have profound implications for belief or disbelief in God. These accounts make their way into science textbooks and popular culture. Why ""Flat Earthers"" had basically disappeared by the third century B.C. In debunking these myths, Keas shows that the real history is far more interesting than the common account of religion at war with science. This accessible and entertaining book lays out powerful arguments that will be embraced by religious believers tired of being portrayed as anti-intellectual and anti-science. 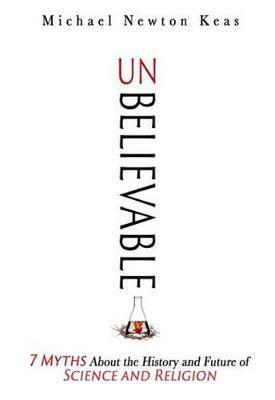 "Unbelievable should be on the shelf of every science popularizer and college astronomy professor. Perhaps then we can begin to purge our culture of the 'science is the enemy of religion' myths Michael Keas slays in his refreshingly contrarian book." "Not content to knock down the myths about the alleged conflict between science and religion, Mike Keas shows where they came from and how science popularizers like Carl Sagan have used them to further their own agendas. Using a wide range of sources, including textbooks and television shows, Keas explains how these myths got into the bloodstream of our culture. An invaluable resource." "Michael Keas decisively debunks an array of myths that have long impeded our understanding of the histories of science and of religion. Unbelievable may earn Keas plenty of enemies, but nobody concerned with real evidence can dismiss his argument out of hand. This is a brilliant, engaging, and important contribution to a debate about truly universal matters." "Michael Keas does a splendid job dispelling viral myths and common errors about the relationship between science and Christianity. This book is well documented and written in a pleasing style accessible to the general reader as well as scholars." "The notion of inevitable, perpetual conflict between science and religion is one of the most prevalent grand narratives in the modern West. It takes many specific forms, and Michael Keas deftly disposes of myths like these with lively, thoroughly researched stories that will leave readers much better informed." "The supposed warfare between science and Christianity has long been a staple of science textbooks and popular science. Michael Keas skewers the most popular myths used to illustrate that warfare, displaying his deep knowledge of the history of science. If you want to understand the true, and positive, relationship between science and Christianity, you should read Unbelievable." Michael Newton Keas, who earned a PhD in the history of science from the University of Oklahoma, is adjunct professor of the history and philosophy of science at Biola University. He is also a senior fellow of Discovery Institute, where he writes high school and college science curricula. During his career, Keas has been a Fulbright scholar and has received research grants from such organizations as the National Science Foundation and the American Council of Learned Societies. He serves on the board of directors of Ratio Christi, an alliance of apologetics clubs on college campuses.